Why are They Different From Adults? By Robert H. Sheinberg, D.P.M., D.A.B.F.A.S., F.A.C.F.A.S. Growth plates are areas at the end of bones that allow bones to grow in height and width. When injured, mild to severe consequences can develop because growth plates are generally weaker than bones and ligaments around them. Injuries occur more frequently to this area. The younger the age of the child or teenager when they develop the fracture, the more critical it is to be seen because of the devastating problems that can develop. These include premature growth plate closure, angular problems in the extremity, limb length discrepancy in which one leg is longer than the other and fractures in the joint that could cause arthritis at a later time. Simple twisting of the ankle or foot can cause the growth plate to fracture and even displace. Injuries are common in all sports, especially soccer and basketball. Direct trauma to the foot or ankle growth plate. Falling from a height and landing awkwardly. Mild injuries that are low energy can cause a small degree of pain and swelling directly on the growth plate. Weightbearing may be uncomfortable but tolerable. The child or teenager may limp. Moderate injuries can cause more pain, swelling and cause more difficulty weightbearing. There would be a general avoidance of trying to put weight on the foot or ankle. Severe injuries can cause pain, swelling, difficulty weightbearing, and the bone and joint may appear out of place. Rarely is there an open fracture in which the bone is sticking out through the skin. A thorough history and physical examination of the injured body part and surrounding joints, muscles, ligaments and bones are necessary. 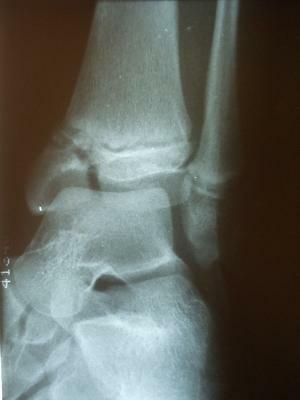 X-rays may show the fracture in many cases. However, in more simple injuries an x-ray may appear to be normal. When x-rays show no abnormality but pain is significant, an MRI may be ordered to better evaluate the bone, marrow and growth plate. Salter I and Salter V fractures are often better visualized on MRIs. When x-rays show a bone abnormality and there is displacement of the bone fragments and growth plates, a CT scan is a better imaging modality. It helps to better guide treatment for the child or teenager. CT scans are necessary when there is a question of whether surgery is or is not needed. Simple injuries of the fibula can be treated in a cast or boot for 4-6 weeks. Weightbearing would be to tolerance. These injuries heal in almost all cases without any short or long-term consequences. Injuries such as this are rarely displaced but if so, a gentle closed reduction is all that is necessary to treat this problem. Injuries of the tibia are best treated in a cast to better protect the growth plate of the tibia. Crutches may be needed for 2-4 weeks and total immobilization time is usually 6 weeks. Long-term consequences are relatively infrequent. 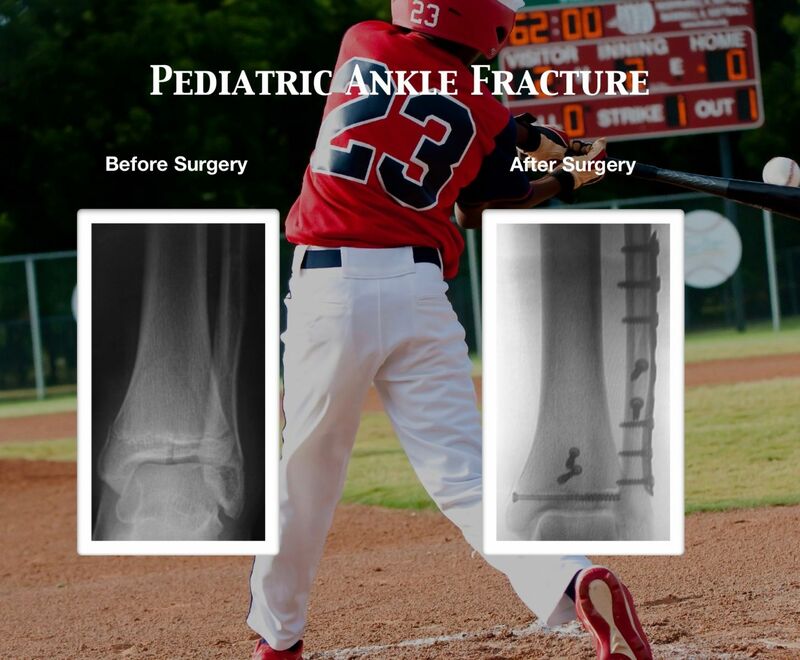 These fractures are the most common type of growth plate injuries to the lower extremity. These injuries are common to the tibia and may be associated with a fibular fracture. Injuries go across the growth plate and up the side or back of the bone, creating a very specific x-ray finding. The risks of a premature physeal closure (permanent closure of a portion of the growth plate) is high when there is a great degree of initial displacement of these fractures. Gentle closed reduction (with or without a general anesthetic) and application of a cast above or below the knee for 6-8 weeks. Gentle closed reduction with twilight or general anesthesia and percutaneous pinning or percutaneous screws. This means that the child or teenager is put to sleep and the growth plate and bones are realigned. Small pins and/or a screw are placed gently through the skin into the bone without making incisions greater than ¼”. Any screw or pin is placed straight across the bone and never across the growth plate unless absolutely necessary. If necessary, a pin can be utilized across the growth plate but screws should be avoided at all costs. If there is significant fracture displacement and closed reduction has failed, it is usually because soft tissue is caught in the fracture gap, not allowing the fracture to reduce properly. At that point open surgery over the fracture site is necessary to remove the soft tissue that is in the fracture site and at that point a reduction is needed to reduce the fracture in most cases under direct observation. 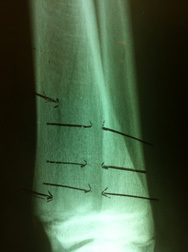 We then utilize small pins and screws to hold the position of the fracture while it heals. 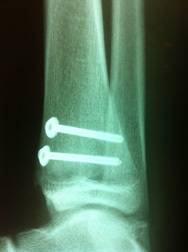 Again, pins and screws are not put across the growth plate. By placing the ankle in its proper position it diminishes (it does not eliminate) the chances of a premature growth plate closure. The greater the residual gap on x-rays, the greater the risk of a growth plate closure. Preop and postop pics of pediatric Salter-Harris II distal tibia fracture S/P percutaneous fixation. Pre and Postop Salter Harris II Distal TIbia Fracture S/P Percutaneous Fixation. 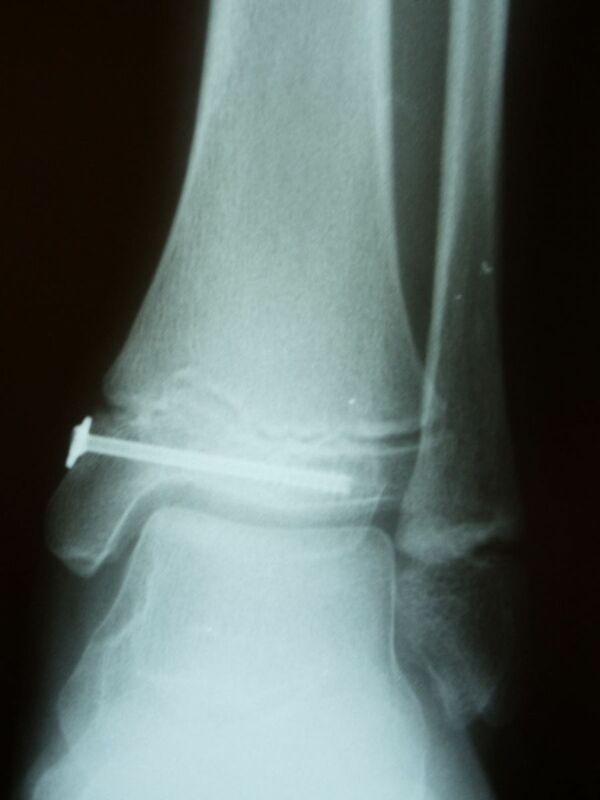 Salter II fractures of the fibula are relatively common and are always treated conservatively with a gentle closed reduction and cast application. The cast may be applied below the knee with nonweightbearing (utilization of crutches) for two weeks followed by a weightbearing cast for another four. No long-term consequences are expected with these types of injuries. These fractures go across the growth plate and down into the bone below the growth plate called the epiphysis and into the joint. These fractures may be non or minimally displaced or they can be grossly out of alignment, affecting the long-term health of the joint. After x-rays, CT scans are almost always necessary to allow complete visualization of the fracture and the degree of displacement, if any. 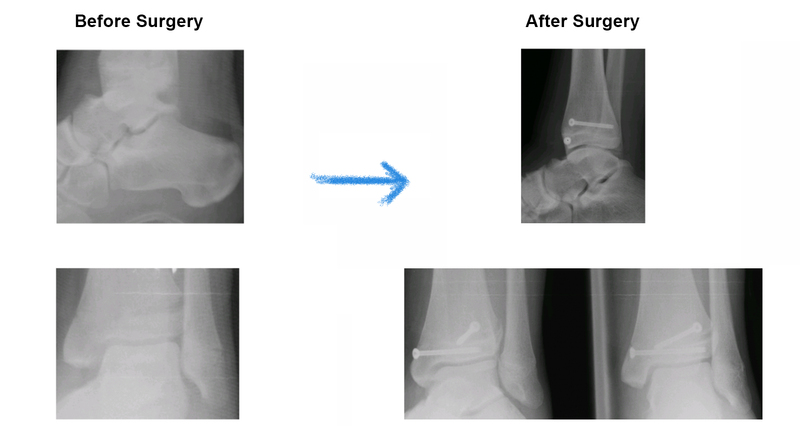 Although it has been generally accepted that 2mm of displacement can be treated with closed reduction, we have a very low threshold for displaced fractures into the joint and we’ll typically fix these fractures with either an open reduction internal fixation or an arthroscopically assisted percutaneous reduction and fixation of these fractures in which we make small holes (straight) around the ankle to realign the joint and get it back in to its anatomical position. Small screws are placed across the bone to hold its position. Screws are usually left in permanently. Displaced fractures into a joint, even if small, should not be tolerated when simple methods of treatment could provide a better long-term prognosis. Although a limb length discrepancy, angular deformity or growth plate premature closure is typically not seen, ARTHRITIS can be present in the long term and surgery is necessary in many cases to avoid it. With an excellent anatomical reduction in which the bone and growth plate are put back into a position, the prognosis is usually excellent and complications are significantly lessened. Postoperatively, non-weight-bearing for 6-8 weeks may be necessary to allow the bone to heal optimally. 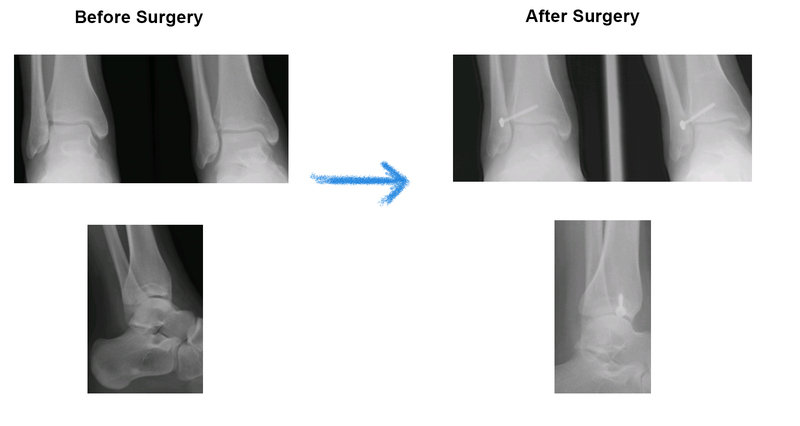 Post - surgical repair of the injury with minimally invasive percutaneous screws traversing the injured area to allow good reduction and healing without affecting active growth plate areas. 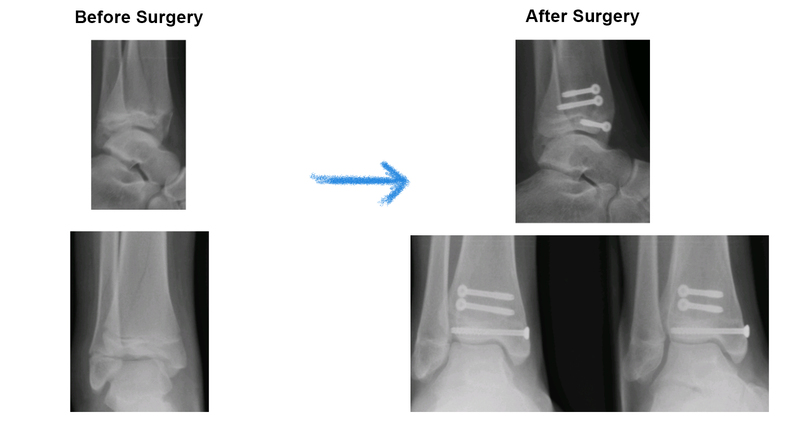 These are post-operative x-rays after minimally invasive percutaneous screws that remain permanently in most cases but does not cross the growth plate to allow healing of the fracture without affecting the growth of the leg bone. Bone healing typically takes 6-8 weeks. These fractures cross the bone above the growth plate, into the growth plate and down into the bone below the growth plate and into the ankle joint. In young children they are more common on the inside of the ankle (medial malleolus). In older children they are more common on the outside of the tibia. These fractures have a higher propensity for a premature growth plate closure and because the fracture goes into the joint, this can cause joint malalignment and arthritis in the future. Angular deformity (bone grows crooked) can also be seen at a later time. This may occur as the tibia fracture does not grow properly and the fibula, which may be unaffected, has its normal growth, which causes the ankle to sometimes tilt in the inner direction. Treatment is critical at the earliest stage possible and CT scans are almost always necessary to check the degree of displacement and the general alignment of the ankle. Even the smallest degree of displacement usually requires a closed reduction and percutaneous pinning or an open reduction to allow the bone to go back to its normal anatomical position and grow correctly while minimizing the risk of a premature growth plate closure. In addition, surgery may be necessary to prevent a limb length discrepancy, angular deformity and arthritis. Open reduction is usually best and is performed by making an incision over the fracture and perfectly aligning the fracture fragments and joint. Small pins and screws are used to maintain the position. Pins and screws are never placed across the growth plate. Instead they are placed parallel to the joint both above and below the growth plate. It is critical to keep anatomical position and if any doubt remains, another CT scan may be necessary postoperatively. If closed reduction and percutaneous pinning is used, arthroscopically assisting to visualize the joint surface can also be helpful. Postoperatively patients are immobilized for 6-8 weeks. It may be necessary to cast above the knee for 2-4 of those weeks. Prognosis is guarded and x-rays are taken to check for fracture healing, angular deformity and at a later time for premature growth plate closure. If anatomic reduction is achieved, the prognosis is better. In high energy injuries when a growth plate is initially significantly displaced, prognosis is fair and complications can occur. These complications are usually not because of the surgery but because of the initial trauma that injured the growth plate during the incident of falling or twisting the ankle. These injuries are usually caused by a crushing injury to the growth plate due to a direct fall without the foot turning in any direction. If a child or teenager jumps down from a height and falls directly on the foot (axial load), injury to the area of the growth plate can occur. Signs and symptoms can include diffuse low-graded swelling and tenderness around and on the growth plate. Weightbearing may be difficult. X-rays are usually negative so clinical suspicion of these injuries is a must. A good history and physical are critical. MRIs may be needed to fully evaluate the degree of injury to the growth plate. Treatment includes nonweightbearing cast for 4-8 weeks. Clinical symptoms (pain and swelling) dictate the length of immobilization. Follow up x-rays are needed because of the risk of premature physeal closure. This can affect parts of or all of the growth plate and treatment may be necessary at a later time.